Map of current rest areas. 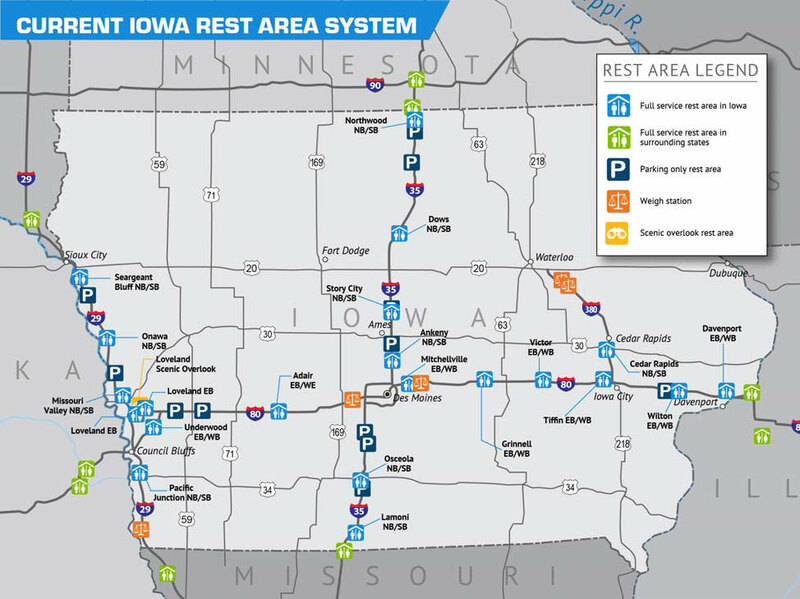 The Iowa Department of Transportation is asking for your help in determining which state rest areas along interstate highways are staying, and which ones will go away. DOT spokesperson Andrea Henry says this is the third phase of the review the rest area program. “What we have done is come up with a draft plan of what we recommend to do with the rest areas in the next 20 years. As part of that plan…we put that out for public comment and let people look through that and give their feedback,” Henry explains. The state has 38 full-service rest areas and 16 that are for parking only. She says they have looked at a variety of factors to see how the rest areas are being used. “Usage of the rest area — which includes how the normal everyday citizen is using that as well commercial drivers like truck drivers,” Henry says. “We’re looking at the ages of the facilities, we are looking at the services they provide, spacing between rest areas.” Henry says they took all the information and came up with a plan. “We treated each one of the rest areas and then we ranked them to look at ones that we could potentially close and still be able to provide the same services or resting points for the traveling public, and made those recommendations for closures,” Henry says. 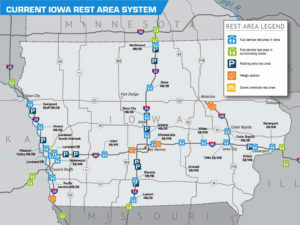 The best rated rest stops in alphabetical order are :I-80 Adair eastbound and westbound; I-380 Cedar Rapids Northbound; I-80 Davenport Westbound; I-35 Dows northbound/southbound; I-35 Northwood northbound/southbound; I-80 Tiffin Eastbound; I-29 Pacific Junction Northbound. The lowest rated in alphabetical order are: I-80 Davenport eastbound; I-680 Loveland eastbound and westbound in Pottawattamie County; I-29 Missouri Valley northbound; I-29 Onawa northbound and southbound; I-35 Osceola northbound and southbound; I-29 Sergeant Bluff northbound; I-35 Story City northbound. Henry says they would like to shut down the lowest rated rest stops in the next 20 years to ensure they have run out their useful life. Henry says they want to make sure they are getting the most use out of the reststops because it takes a lot of money to run them. “They currently cost about $3.7 million per year for operations. That’s just to keep them going,” she says. “And then of course we have the improvements that we program. In the current five-year program that includes seven point-five million over the next five years.” Henry wants anyone who uses the reststops to look over the recommendations and give their opinion. “You can go to our website — which is iowadot.gov/restareaplan. And on that are all of the background materials as well as that draft implementation plan. There is also a nice video on there that helps explain the process and our approach to the rest area system,” Henry says. Henry says they will be taking public comment through September of 2019. She says it stretches for more than one year to give time for a study of truck parking that’s underway to be completed. “And then after that we will take all of those comments into consideration and look at the draft plan and draft a final plan,” Henry says. The rest areas were first constructed along the interstates in the 1960’s. Federal officials originally recommended that there only be a 30 minute drive between a rest area or other available facility, and that was later changed to one hour. The availability of services along the interstates has changed as cities grew up around them and that has sometimes led to reststops that are no longer needed. The DOT closed two reststops on I-80 near Waukee after a survey in 2012 found they were not being heavily used.